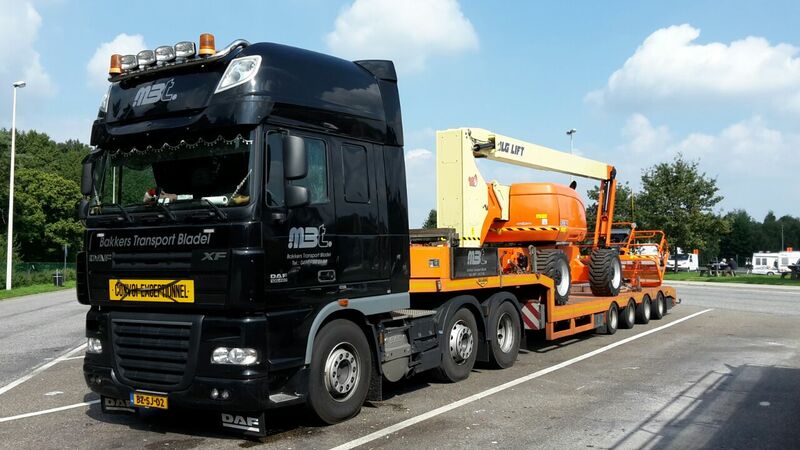 M. Bakker Transport is a Dutch company which specializes in forklift truck transport and other heavy machinery and oversize transporting services. The company offers its services throughout most of Europe and has a fleet of 10 tractors and 7 vehicles, capable of forklift truck transport. The transportation of forklifts is a delicate procedure which requires special equipment and years of experience and expertise. At M. Bakker Transport, you can find all of these qualities and more. In order to safely transport heavy machinery such as forklifts you will need to take a few things into account. A forklift is a lot heavier than a car for instance. That requires special equipment to prepare the forklift for transport. You need to keep the machine from shifting and it needs to be done without damaging the forklift. Forklift truck transport also means that the fuel system needs to be prepared. Forklifts can be equipped with a variety of fuel systems, such as petrol or diesel fuel tanks, or batteries. Especially a battery powered forklift is very heavy and the fuel system will have to be removed and secured for safe forklift truck transport. All of this and more is taken into account by the professionals at M. Bakker Transport. For more information about forklift truck transport, please contact M. Bakker Transport at +31 (0)497-64 21 86.